An old pine tree named Orinda is suffering from the pollution of the nearby river. Her only hope of a legacy is her last pine cone. But Grimy has stolen it. In a last tearful effort, Orinda reaches out her branches to the animals of the planet for help. Coming from all over the world, the animals rush in to save her. And as they commit to stopping Grimy and his dirty habits, their fur becomes green. They’ve become the Greenzys. Grimy is the symbol of all those who choose to pollute the environment, through negligent trash disposal and failure to recycle. And the Greenzys are the hope for Earth’s future. 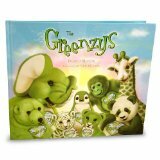 In The Greenzys, kids will see why it’s important to protect our environment from those who want to do it harm. This cute story shows us how to be environmentally conscious in a way kids can relate, and the beautiful illustrations by Cris De Lara enhance this green message. The book is printed in an eco-friendly manner, and a portion of the proceeds from book sales benefits the Environmental Media Association. And in celebration of the 40th anniversary of Earth Day, for every Greenzys book purchase made between April 5 and December 31, 2010, the Arbor Day Foundation will plant one tree in our nation’s forests.